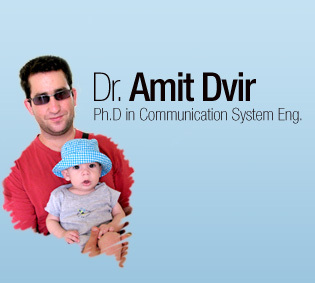 Dr. Amit Dvir | Ph.D in Communication System Eng. - R. Yozevitch, B. Ben-Moshe, A. Dvir, "GNSS Accuracy Improvement Using Rapid Shadow Transitions", IEEE Transactions on Intelligent Transportation Systems, 2014, Vol. 15, Num. 3, pp. 1113-1122. -T. V. Thong, L. Buttyán, A. Dvir, "On formal and automatic security verification of WSN transport protocols", ISRN Sensor Networks, 2014, accepted (20 pages). -	B. Ben-Moshe, A. Dvir, M. Segal, and A. Tamir, "Centdian Computation in Cactus Graphs", Journal of Graph Algorithms and Applications, Vol. 16, Num. 2, pp. 199 - 224, 2012. - A. Dvir, and M. Segal, "Placing and Maintaining a Core Node in Wireless Ad Hoc Sensor Network", Journal of Wireless Communications and Mobile Computing, 10(1), 826-842, 2010. -A. Dvir, R. Giladi, I. Kitroser and M. Segal, "Efficient Decision Handoff Mechanism for Heterogeneous Networks", International Journal of Wireless & Mobile Networks, Vol. 2, Num. 1, pp. 1-13, 2010. -	A. Dvir, and M. Segal, "The (k, l) Coredian Tree for Ad Hoc Networks", Ad Hoc & Sensor Wireless Networks, 6(1-2): 123-144, 2008. -	Y. Ben-Shimol, A. Dvir, and M. Segal. "SPLAST: A Novel Approach for Multicasting in Mobile Wireless Ad Hoc Networks", Advances in Wireless Ad Hoc and Sensor Networks, Signals and Communication Technology 2008, pp. 256-273. Springer. -	B. Ben-Moshe, Y. Ben-Yehezkel, Y. Ben-Shimol, A. Dvir, and M. Segal, "An Automated Wireless Fixed-Access Network Antenna Positioning Algorithm", Journal of Heuristics, 13(3): 243-263, 2007. -	R Dubin, A Dvir, O Pele ,J Muehlstein ,Y zion, m Bahumi,I Kirshenboim, Analyzing HTTPS "Encrypted Traffic to Identify User’s Operating System, Browser and Application", CCNC-WHSP 2017 . - R Dubin, A Dvir, O Pele, O Hadar, "I Know What You Saw Last Minute-Encrypted HTTP Adaptive Video Streaming Title Classification", Blackhat London , 2016 . -	R Dubin, A Dvir, O Pele, O Hadar, "I Know What You Saw Last Minute-Encrypted HTTP Adaptive Video Streaming Title Classification", 2016 . -	M. Stewart, A. Dvir, R. Kannan, "CASPaR: Congestion Avoidance Shortest Path Routing for Delay Tolerant Networks", International Conference on Computing, Networking and Communications, 2016 . -	R. Dubin, A. Dvir, O. Hadar, N. Harel, R. Barkan: Multicast adaptive logic for Dynamic Adaptive Streaming over HTTP network. INFOCOM Workshops 2015: 269-274 . -	R. Dubin , A. Dvir , O. Hadar, T. Frid and A. Vesker, "Novel Ad Insertion Technique for MPEG-DASH", CCNC 2015. -	R. Dubin , A. Dvir , O. Hadar, R. Shalala, O. Ahark, "Video Complexity Hybrid Traffic Shaping for HTTP Adaptive Streaming", CCNC 2015. -	R Dubin, O Hadar, A Dvir, B Ben-Moshe, "A novel multicast adaptive logic for dynamic adaptive streaming over HTTP network", Electrical & Electronics Engineers in Israel (IEEEI), pp. 1-4, 2014. -	A. Dvir, L. Buttyan, V. T. Ta, "Formal Security Verication of Transport Protocols for Wireless Sensor Networks", International Conference on Computer Science, Applied Mathematics and Applications (ICCSAMA), pp. -	R. Dubin, O. Hadar, A. Dvir, "The Effect of Client Buffer and MBR Consideration on DASH Adaptation Logic", IEEE WCNC, pp. 2178-2183, 2013 (~40%). -	B. Ben-Moshe, A. Dvir, E. Berliner, "Performance Monitoring Framework for Wi-Fi MANET ", IEEE WCNC, pp. 4463-4468, 2013 (~40%). -	A. Dvir, L. Buttyan, V. T. Ta "SDTP+: Securing a Distributed Transport Protocol for WSNs using Merkle Trees and Hash Chains", IEEE ICC, pp. 20732078, 2013 (39%). -	R. Yozevitch, B. Ben-Moshe, A. Dvir, "Accurate Lane Detection Using Commercial GNSS Devices", WPNC, pp. 1-5, 2013. -	B. Ben-Moshe, A. Dvir, H. Levi, P. Shamil, "Indoor Positioning using Time of Flight Fingerprinting of Ultrasonic Signals", International Conference on Indoor Positioning and Indoor Navigation (IPIN), pp. 1-6, 2013. -	B. Ben-Moshe, A. Branderud and A. Dvir, "Modeling adaptive rate video transmission in Wi-Fi MANET", MSWiM, pp. 167-174, 2012 (23%). -	B. Ben-Moshe, E. Berliner, A. Dvir and A. Gorodischer, "A joint framework of passive monitoring system for complex wireless networks", Workshop on Emerging Densely Connected Network, IEEE Consumer Communications and Networking Conference (CCNC, 31%), pp. 55-59, 2011. -	A. Dvir, T. Holczer and L. Buttyan, "VeRA - Number and Rank Authentication in RPL", Workshop on Wireless and Sensor Networks Security, IEEE International Conference on Mobile Ad-hoc and Sensor Systems, pp. 709-714, 2011. -	A. Dvir, and N. Carlsson, "Power-aware Recovery for Geographic Routing", IEEE Wireless Communications & Networking Conference (WCNC, 44%), pp. 1-6, 2009. -	A. Dvir, and M. Segal, "The (k, l) Coredian Tree for Ad Hoc Networks", Conference on Distributed Computing Systems Workshops, 267-272, 2008. - Y. Ben-Shimol, A. Dvir, and M. Segal. "SPLAST: A Novel Approach for Multicasting in Mobile Wireless Ad Hoc Networks", Network Theory and Applications: Special issue on Advances in wireless networks and mobile computing, 2008. -	A. Dvir, and M. Segal, "Placing and Maintaining a Core Node in Wireless Ad Hoc Sensor Networks", IFIP Networking (32%), 13-24, 2007. -	B. Ben-Moshe, Y. Ben-Yehezkel, Y. Ben-Shimol, A. Dvir, and M. Segal. "An Automated Wireless Fixed-Access Network Antenna Positioning Algorithm", IEEE Consumer Communications and Networking Conference (CCNC, 30%), 902 - 906, 2006. 1. US Provisional Patent Application 61/354,222 - Multi-program transmission accessible to multiple users using Wi-Fi. 2. US Provisional Application 61/658,417 - Separate-Channel Transmission of Error-Correction Data.